AccuRate is a comprehensive test automation suite built for DevOps and Agile environment. It helps application developers and testers overcome with various issues and problems that hinder development and delivery, such as multiple platforms and versions of operating systems, as well as various screen sizes of devices. AccuRate provides users with a powerful test automation solution that they can implement across various mobile platforms (iOS, Android, Web) and desktop browsers, in real-time. It comes with over 600 pre-built functions for mobile and web automation leveraging open source tools like Appium, Selenium, and Protractor. AccuRate provides testing and DevOps teams with a set of rich features for test execution, and management using data-driven and keyword-driven testing capabilities. 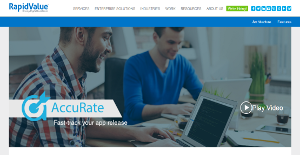 AccuRate provides app developers and testers with a single, unified test automation solution that lets them build test scripts and test their apps across different mobile operating systems (iOS, Android, and Web) as well as desktop browsers. AccuRate reduces script development effort by as much as 60%. Its zero-code scripting uses a keyword-driven approach as well as pre-built functions that help automate the test authoring process. Its all-in-one test script eliminates the need for creating individual scripts for multiple mobile platforms, browsers, and screen sizes. The ‘eclipse plugin’ further spurs app development to faster speeds. AccuRate also provides seamless integrations with popular CI servers, defect management tools, and behavior-driven development (BDD) framework. With AccuRate, your can perform parallel testing on the cloud. This functionality lets you execute your script on Perfecto Cloud, AWS device farm, and Sauce Labs. You can also run your script simultaneously on multiple on-premise devices while its reusable workflow capability allows you to automate the deployment of your script across multiple environments and platforms. If you are interested in AccuRate it might also be a good idea to examine other subcategories of Best Test Management Software collected in our database of B2B software reviews. There are well-liked and widely used solutions in each software category. But are they automatically the best fit for your enterprise’s specific requirements? A market-leading software product may have thousands of subscribers, but does it provide what you need? For this reason, do not blindly spend on popular systems. Read at least a few AccuRate reviews and consider the elements that you desire in the software such as the fees, main functionality, available integrations etc. Then, choose a few apps that fit your requirements. Try out the free trials of these products, read online opinions, get explanations from the maker, and do your research thoroughly. This profound homework is sure to aid you find the most excellent software application for your organization’s unique requirements. How Much Does AccuRate Cost? We realize that when you make a decision to buy Test Management Software it’s important not only to see how experts evaluate it in their reviews, but also to find out if the real people and companies that buy it are actually satisfied with the product. That’s why we’ve created our behavior-based Customer Satisfaction Algorithm™ that gathers customer reviews, comments and AccuRate reviews across a wide range of social media sites. The data is then presented in an easy to digest form showing how many people had positive and negative experience with AccuRate. With that information at hand you should be equipped to make an informed buying decision that you won’t regret. What are AccuRate pricing details? What integrations are available for AccuRate? If you need more information about AccuRate or you simply have a question let us know what you need and we’ll forward your request directly to the vendor.